Territory of former Bulgaria ca 1045 as theme. The Cometopuli dynasty (Bulgarian: Династия на комитопулите; Byzantine Greek: Κομητόπουλοι) was the last royal dynasty in the First Bulgarian Empire, ruling from ca. 976 until the fall of Bulgaria under Byzantine rule in 1018. The most notable member of the dynasty, tsar Samuel is famous for successfully resisting Byzantine conquest for more than 40 years. Sometimes the realm of the Cometopuli is called Western Bulgarian Kingdom or Western Bulgarian Empire. The actual name of the dynasty is not known. “Cometopuli” is merely the nickname which is used by Byzantine historians to address rulers from the dynasty as its founder, Nicholas, was a komes (governor, cognate to "count"; Byzantine Greek κóμης, from the Latin; Bulgarian Комита Komita) probably of the region of Sredetz (the present-day capital of Bulgaria, Sofia). According to some sources the dynasty was of Armenian origin. In 969 AD and following the Russo-Byzantine conquest of Eastern Bulgaria, count Nikola assumed control of the Bulgarian lands west of the rivers Iskar and Struma. By the time of the Byzantine conquest of Preslav and the dethronement of Tsar Boris II in 972, Nikola had been killed and the rule assumed by his four sons, David, Aaron, Moses, and Samuil. David led the defence of southwestern Bulgaria and resided in Prespa, Moses of southeastern Bulgaria residing in Strumica, Aaron ruled over the region of Sredetz, whereas Samuel was in charge of northern Bulgaria with the town of Bdin (Vidin). Both David and Moses lost their lives early – David was murdered by wandering Vlachs, whereas Moses died during the siege of Serres. A conflict broke out between Samuil and Aaron as the latter grew more and more pro-Byzantine and on June 14, 976 Aaron was executed near Dupnitza. Later the same year, the dethroned Boris II and his brother, Roman, managed to escape from captivity in Constantinople and reached the borders of Bulgaria. Boris II was, however, killed by mistake by the border guards. As a result, it was Roman who was crowned as Bulgarian Tsar although real power and the control of the army lay in the hands of Samuel. Samuel proved to be a successful leader inflicting a major defeat on the Byzantine army commanded by Basil II at the Gates of Trajan and retaking north-eastern Bulgaria. His successful campaigns expanded the Bulgarian borders into Thessaly and Epirus and in 998 he conquered the principality of Duklja. In 997 Samuel was proclaimed Emperor of Bulgaria after the death of the legitimate ruler, Roman. After the death of Samuel in 1014, the crown passed on to his son, Gavril Radomir (1014 – 1015). In 1015, he was murdered by his first cousin and son of Aaron, Ivan Vladislav. With his own death in 1018 the First Bulgarian Empire came to an end. Although, some of the nobility and the army rallied around Presian II as his father's successor. Presian II and his brothers Aron and Alusian headed a determined opposition to the Byzantine conquest in the mountain Tomorr in 1018. Eventually Presian II and his brothers were forced to surrender, and were integrated into the court nobility in Constantinople. An attempt at restoration of Bulgarian independence was made some 20 years later by Peter (II) Delyan (1040-1041), son of Gavril Radomir. He, aided by his cousin Alusian organised an uprising and managed to push away the Byzantines from Ohrid for a short period, but was eventually betrayed by Alusian. Alusian's heirs were given noble titles and land in the Byzantine Empire. After the fall of Bulgaria, Samuel's descendants assumed important positions in the Byzantine court after they were resettled and given lands in Asia Minor and Armenia. Оne of his granddaughters, Catherine, became empress of Byzantium. Another grandchild, Peter II Delyan, led an attempt to restore the Bulgarian Empire after a major uprising in 1040 – 1041. Two other women of the dynasty became Byzantine empresses, while many nobles served in the army as strategos or became governors of various provinces. Through his maternal grandmother Maria of Bulgaria, the Byzantine emperor John II Komnenos was a descendant of Tsar Ivan Vladislav. The Bitola inscription of Ivan Vladislav, where he claims Bulgarian origin to himself and to his people. There has been a debate among historians, in which some view the Kingdom of the Cometopuli, as a separate entity from the First Bulgarian Empire. The Cometopuli kept the title "Emperor of Bulgarians", but some aspects that appeared during their reign, made their state differ from the Bulgarian empire. Its centres (Skopje, Ohrid, Prespa and Bitola) were located in what today is referred to as the geographical region of Macedonia, but at that period, they were in a province of the First Bulgarian Empire, called Kutmichevitsa. The Byzantinologist George Ostrogorsky discusses the issue and concludes that to its creators and to the Byzantines it was simply Bulgarian kingdom, but for various geographical, political and religious factors he labels their state Macedonian Empire. Dimitri Obolensky, another Byzantinologist, refers to Samuil's state as an "independend empire of Western Bulgaria" that originated in Macedonia. 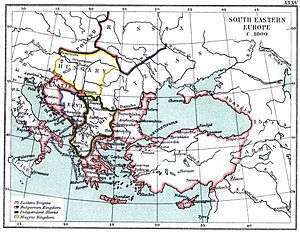 Some other authors also distinguish it as a Western Bulgarian Empire, but most of the scholars see the dynasty as a direct continuation of the First Bulgarian Empire. However, in the Republic of Macedonia the official historiography refers to it as "Slavic Macedonian" Empire, but this view is an instance for backdated modern nationalism. ↑ Byzantium's Balkan frontier: a political study of the Northern Balkans, 900-1204, Author Paul Stephenson, Publisher Cambridge University Press, 2000, ISBN 0-521-77017-3, pp. 58-66. ↑ The Decline and Fall of the Roman Empire, Edward Gibbon, J. B. Bury, Wildside Press LLC, 2004, ISBN 0-8095-9240-1, p. 142. ↑ On his writings of the 11th-century historian Asoghik wrote that Samuil had only one brother. According to Asoghik who lived in Derjan, located in an Armenian region of the Byzantine Empire, Samuil was also from Derjan and had Armenian origin. ↑ Asoghik version is supported by the historian Nicholas Adontz who analyzes in depth the events and facts of the century and comes to the conclusion that Samuil had only one brother – David. ↑ "V. Zlatarski - Istorija 1 B - Priturka 15". Retrieved 2008-09-10. ↑ In The Bogomils: A Study in Balkan Neo-Manichaeism, Obolensky discusses the connection between the Bogomils and the Cometopuli, and traces the origin of both in Macedonia. ↑ Georgije Ostrogorski, Geschichte des Byzantinischen Staates. C.H.Beck, 1963, ISBN 3-406-01414-3, s. 250-255. ↑ "Politically and ecclestistically the new empire was direct descendant of the empire of Simeon and Peter, and was regarded by Samuel and the Byzantines alike as being simply the Bulgarian Empire. For apart from Byzantium, only Bulgaria at that time possessed a tradition of empire with a patriarchate of its own". George Ostrogorsky, "The history of the Byzantine State" (Chapter VI - 6. The Apogee of Byzantine power - Basil II) pp. 301-302. Rutgers University Press, 1957. ↑ An outline of Macedonian history from ancient times to 1991. Macedonian Embassy London. Retrieved on 2007-04-28. ↑ Who are the Macedonians? Hugh Poulton, C. Hurst & Co. Publishers, 2000, ISBN 1-85065-534-0, p. 20. Степанос Таронеци-Асохик (Asoghik, Stepanos T., 10th - 11th c.). Всеобщая история Степаноса Таронского - Асохика по прoзванию, писателя ХІ столетия. Перевод с армянскoго и объяснения Н.Эминым. Москва, Типография Лазаревского института восточных языков. 1864. ХVІІІ, 335 стр. Stepanos, Tarōnetsi (Stepanos Asoghik Taronetsi, 10th-11th c.) Tiezerakan patmutyun, Erevan, 2000. Adontz, Nikoghayos. Samuel l'Armenien, Roi des Bulgares. Bruxelles, Palais des academies, 1938. Adontz, Nicolas. Etudes Armeno-Byzantines. Livraria Bertrand. Lisbonne, 1965. Lang, David M. The Bulgarians, London, 1976. Lang, David M. The Armenians. A People in Exile. London, 1981.